Butler’s Micheal Kreill (3) and Ryan Wertz (14) block out Xenia star Samari Curtis during Butler’s 79-73 win at Xenia on Tuesday. 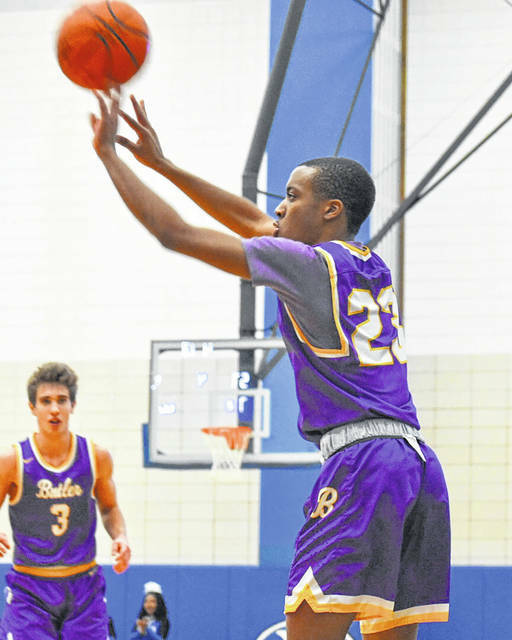 Quentin Glover scored 15 points and pulled down 12 rebounds during Butler’s 79-73 win at Xenia on Tuesday. Tyler Montegue shoots a three pointer during during Butler’s 79-73 win at Xenia on Tuesday. XENIA — The Butler Aviators traveled to Xenia on Tuesday night to face a Buccs team more dangerous than their mediocre record would indicate. 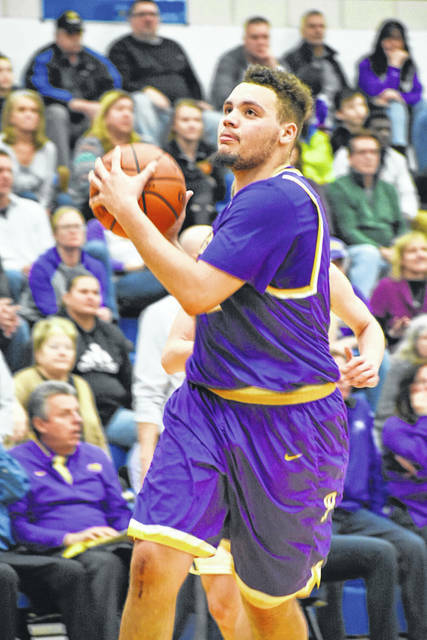 Samari Curtis, the GWOC’s leading scorer came into the game averaging over 31 points a game and the Aviators remembered the show he put on a year ago in a Butler overtime win. On Tuesday, Curtis was quiet for three quarters thanks to tough defense by Butler’s Bryant Johnson. Allowing just 13 points through the first three periods, Butler steadily built a double digit lead at 49-39. Little did they know that despite Curtis’ 27 fourth quarter points, ultimately Xenia would have no answer for Butler’s senior guard Michael Kreill. Kreill, limited to just two points in the first half, scored 28 in the second half as the Aviators held off a late surge for a 79-73 win. The game was a battle of wills. The first quarter remained close throughout, but when Butler took a 13-12 lead, it would prove to be the final time Xenia held an advantage. Leading 18-14 to open the second quarter, Cooper Justice drained a three and Tyler Montegue scored which forced Xenia to take a timeout trailing by 9. The Buccs responded with a 12-4 run and closed the gap to one twice, but could get no closer as Butler scored the last five points of the half to take a 34-28 lead at the half. Enter Kreill. The Butler guard scored 11 of Butler’s 15 points in the third quarter, and his 11 points matched that of the entire Xenia team. Butler finally built its largest lead of the game to that point at 49-39 heading to the final period, but the Buccs weren’t going away. Two quick baskets for 5 points forced Wyrick to call time, and the Kreill-Curtis duel was on. Kreill scored 12 straight points for Butler versus 10 for Curtis, but Xenia still trailed by 10 at 64:54 with 4:41 to play. Following a Xenia timeout, Curtis hit a bomb for three and scored again to 64-59 but Quentin Glover had a basket to stop the momentum. Curtis lit up for one last push with 8 straight points to close to within six at 74-68, but Xenia would get no closer than 6 the rest of the contest. Glover had 15 points on 7-for-11 shooting and pulled down 12 rebounds for a double-double. “I don’t know how many rebounds Quentin had (12) but he’s a kid the ball just always seems to find him,” said Wyrick. “He helped us on the glass big time. It was nice being able to throw it into him and he made some nice moves in the post. Curtis would finish the game with 40 points while Kreill finished with 30 points, 8 rebounds, 3 assists and 3 steals. Montegue scored 12 for the Aviators and had five assists while Justice scored 9 and recorded four assists. 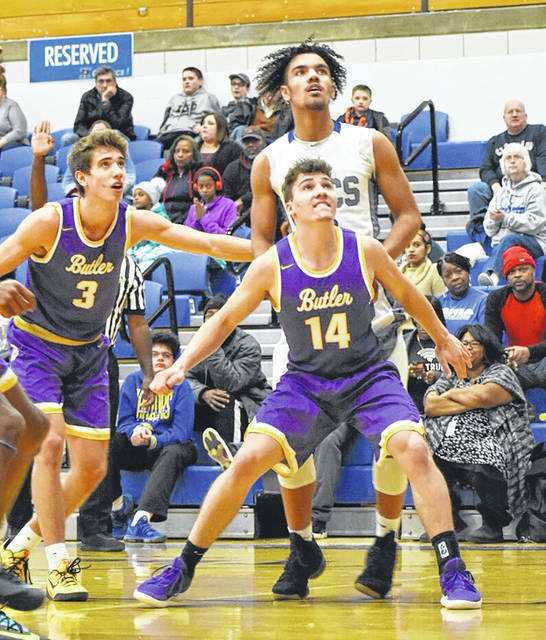 The win lifts Butler to 13-2 overall and, more importantly, 8-2 in the GWOC American North, just a game behind Sidney in the loss column in what has become a two-team race for the final GWOC North title.